Entrepreneurship provides accessible and practical content for students hoping to start their own businesses. It also provides students with a strong basis for innovative thinking, which can be applied to any field or career they pursue. With a focus on service-oriented businesses, this text uses real-world examples, multimedia content, and thought-provoking callouts to engage students and make concepts relatable. Together, these features make this academically-focused book easy to read and understand. A focus on service-oriented businesses. Small-business examples that make concepts engaging and relatable. Multimedia content in every chapter to engage visual learners. Captivating opening cases focused on smaller businesses and start-ups. “How Would You Handle It?” callout boxes that pose real-life challenges and questions to readers. “Leveraging” callout boxes that explain how to leverage outside resources to make business decisions. 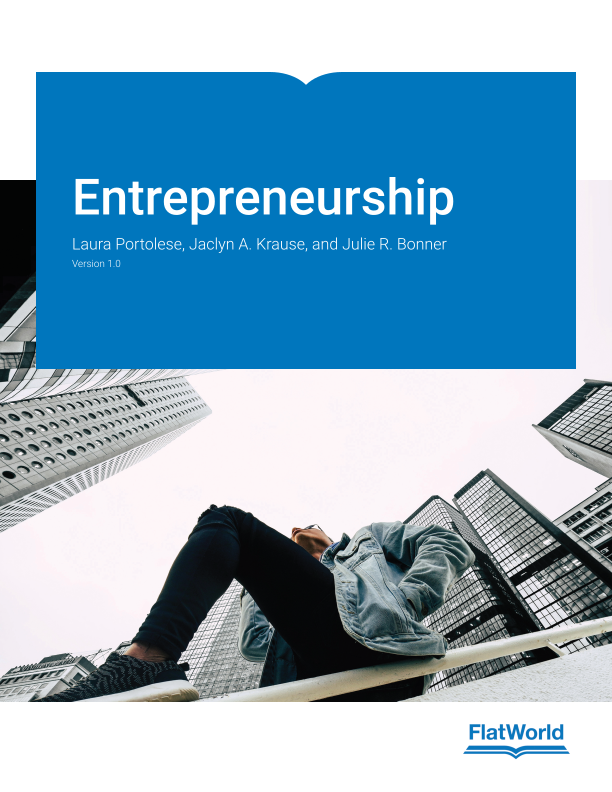 Chapter 1: What is Entrepreneurship? 1.3 Why Start Your Own Business? 1.4 Dispelling The Myths About Small Business Ownership: It’s A Lot Of Work! Chapter 3: How Do I Determine a Good Idea and Opportunity? Chapter 4: How Do I Write a Marketing Plan? Chapter 5: How Do I Perform Financial Analysis? 5.2 How Do I Estimate Needed Funding? 5.3 How Do I Read Financial Statements? 5.4 How Do I Perform A Break Even Analysis? 5.5 How Do I Write A Financial Plan? Chapter 6: How Do I Write an Operational Plan? Chapter 9: How Do I Manage Change? Chapter 11: How Do I Grow My Business? Homework System for this title will be live by November 01, 2019. Laura Portolese (Doctorate, Argosy University) is the author or co-author of four books with FlatWorld (Human Resource Management, Human Relations, The Art of Supervision and Leadership, and Consumer Behavior Today). Professor Portolese holds a master of business administration from City University and a doctorate of business administration from Argosy University. She teaches in the Department of Information Technology and Administrative Management, part of the Cenral Washington University’s College of Education and Professional Studies. Before beginning her teaching career, Professor Portolese worked for several organizations in management and operations. She’s also an entrepreneur who has performed consulting work for companies such as Microsoft. Jackie Krause (Ph.D., Walden School of Management) earned her degree in applied management and information sciences. She possesses thirty-five years of comprehensive and progressive experience in information technology work including network administration, application design and development including web-based applications, website development, information systems analysis, design, and architecture, and information technology project management. Professor Krause has been an academic department chair responsible for supervising the activities of forty-five full-time and adjunct faculty in the School of Information Systems and Technology. She is also an IT professional who has been embedded within business units and has supervised faculty and help desk staff, led teams of system administrators, and led multi-discipline, cross-functional project teams as a project manager. Julie Bonner (Doctorate, University of Phoenix) earned her degree in management. She has consulted extensively for large clients in the aerospace, consumer products, and gaming industries providing services in accounting and information systems design.